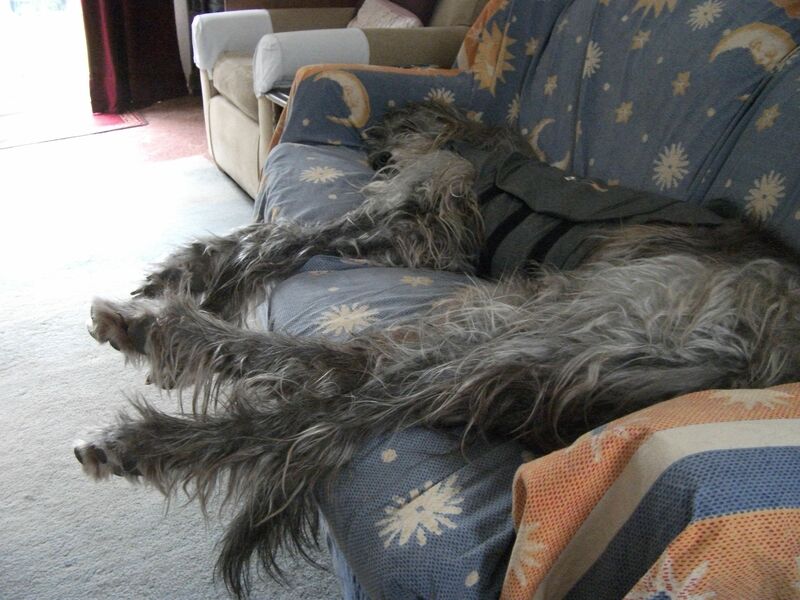 Gandalf is a typical Sighthound; flat-out (running) or flat-out (dozing). He has a gentle and trusting temperament; welcoming visitors to the house but without pestering them once the greeting is done. If anything gets posted through the letterbox and disturbs Gandalf, he gives it a dirty look but does not move unless it actually lands on him. So, why would a dog like Gandalf need a Thundershirt? Well, he’s a sensitive soul, and over the years has developed a few phobias. Thunder and fireworks are the common ones he shares, and the sound of gunshots – but he also gets worked up if it’s very windy and things are blowing around outside, especially at night. Hot air balloons are a particular phobia, and this was a real problem a couple of years ago when the sky was suddenly full of them. Not sure what happened to the balloons but the epidemic left him scarred so that if anyone in the neighbourhood is doing work with a blow torch or anything that sounds like a hot air balloon burner being fired, his anxiety is triggered. Gandalf’s anxiety begins with general restlessness, a worried expression, pressing himself against us, and looking out of the windows. The next stage is panting, whining and shaking, which then leads to the worst bit where he attempts to climb up on to the highest surface he can find. Given that most such surfaces (desk, table, mantelpiece, kitchen worktops) are not just slippery but crowded with clutter and appliances, it is important to nip the anxiety in the bud, if at all possible. My natural reaction is to cuddle and reassure him but from what I have read this is wrong. By making a fuss of him when he is pacing and panting I am supporting and encouraging his behaviour, and yes, I can see how ignoring the thunderstorm, firework display or whatever is happening might be the best policy – but my lack of interest does nothing to convince him that there is no reason to be afraid. Some episodes are predictable, such as the weekends either side of November 5th, although fireworks seem to go off all the year round now, at birthday parties or whatever. Last November I bought some herbal calming tablets but I couldn’t say whether they helped or not, and didn’t know how soon they would take effect (if at all) and for how long. Without having two Gandalfs and giving the tablets to one but not the other, there is no way of knowing. 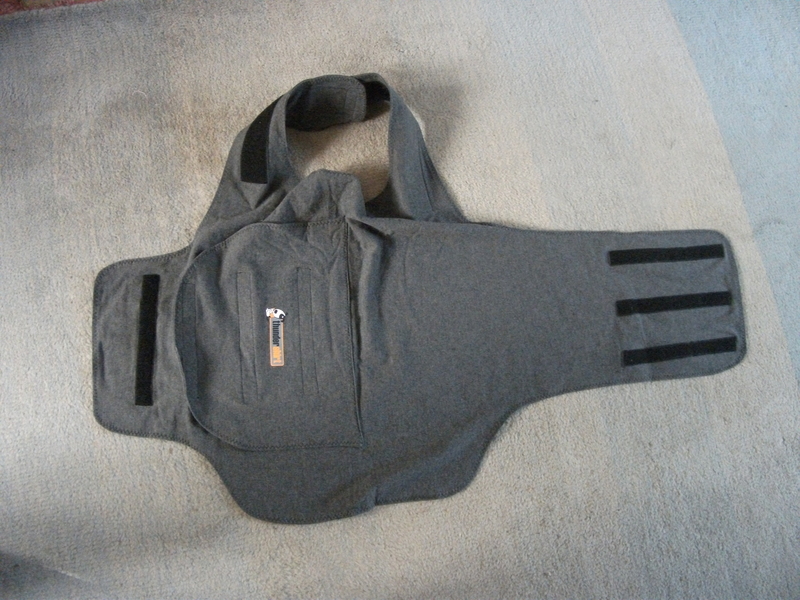 Anyway, l found the Thundershirt on the net and it had enough good reviews to make it worth a try. It is made of soft stretchy cotton jersey material and well-designed for the shape of the dog. The idea is that it gives him a reassuring hug around the chest but without being uncomfortable or constricting. I guess it’s a reinvention of the old idea of swaddling babies to keep them soothed. The bit I have looped together fastens below the neck and the long flap goes down under the deepest part of the chest, wrapping around and up, and is secured beneath the side flap. It’s all held in place with Velcro, which is noisy to pull apart so it’s a good idea (and recommended on the blurb) to try it out first in none-stressful situations with food treats involved. I had wondered if Gandalf would tolerate wearing it, but he was fine. There’s no way I could wear one – can’t stand any clothing that clings. You can get also get them for cats … maybe you could get it on a very chilled-out cat in preparation for a visit to the vets or something … and hopefully not have to tear the Velcro apart too many times to re-adjust the fitting. Not the best view of the Thundershirt as I took this discreetly from an armchair rather than standing over him with a pointy camera. He is still a little wide-eyed and tense, but the panting and pacing has stopped. Happily, we’ve only had cause to try it on a couple of occasions, but it takes the edge off immediately. Early days yet, it’s a recent purchase, but so far so good. Thirty quid well spent, I think. What a good idea! And it sounds like it’s working too. I was once at a party that had fireworks, and a doberman that I did not know, and who was terrified by them, sat next to me and lent against me. I just let him lean and didn’t move and tried to give out a calm a reassuring vibe. Poor things haven’t a clue what is happening and it is no surprise they don’t like it.